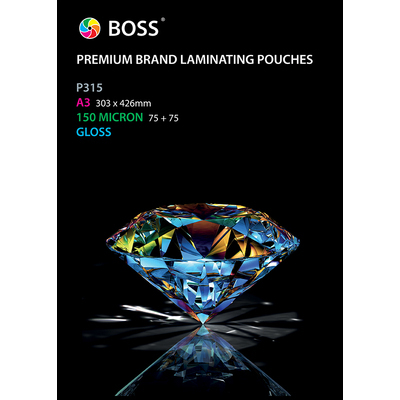 Our Laminating Pouches are the best way to ensure your most important documents are kept in pristine condition. Made from a high quality 2 x 75 micro film, each clear gloss pouch is ideally sized to accommodate A3 sheets of paper. They are compatible with most types of laminating machine while being a quick and efficient way to protect everything from legal documents through to children's artwork. This pack of 100 laminating pouches is an economical addition to every work environment including offices, care homes and through to nurseries while being easy to store away until required. We offer our laminating sheets in an A4 size too alongside our Heavy Duty Laminator, both available online here for exceptional wholesale prices.